My name is Alison Milyika Carroll. I first started coming to the art centre as a child, coming in the school holidays. I learnt by watching my mother weave, make floor rugs and paint on Christmas cards. On leaving school I joined in, later we learnt batik. I have five children and am also a qualified health worker. But my art is something that I always return to. I have travelled to many places for my art; my first trip was to England. More recently I travelled to Singapore for a residency at the Dragon Kiln site at the Jalan Bahar Clay Studios. Our art centre is always changing, one generation passing knowledge on to the next, each generation making it their own; learning new skills and trying new ways. I started with weaving with the old ladies, practised batik for many years and then painting and now ceramics. I was one of the first Ernabella women to try my hand at ceramics. Now it is my main medium. The stories we tell are both walka and Tjukurpa, which is our way of taking both the old styles and the new styles and making it our own. This art centre started in 1948. It was the first of its kind. The founding artists might have passed away but the art centre keeps going, stays strong. Young potters like Lynette are the next generation. Lynette’s daughters and the girls and young fellas learning ceramics at the school are the future. But like we did before them they will take some of what was passed on to them and they will add it to, make it their own. Our history stays with us, like a strong old tree it grows, another branch is added. The new branch is supported by the strong trunk. This is Anangu way. This is how we keep going and will do for generations into the future. My name is Elizabeth Dunn. The story of my work in clay at Ernabella Arts started in 2015. I had been painting at the art centre a few years before that. But I started making small cups in the art centre in 2015. I started with those small cups and quickly started making more and more work and it got bigger too. That’s the way it works at Ernabella Arts. You start working small, you watch and learn from your family and other artists and then you start getting bigger and bigger. Now people are starting to watch me too, especially now that I hand build. From the very start I have drawn my kampurara tjukurpa in clay. Kampurara are bush tomatoes, which in the old times were one of the main foods for Anangu. Today sometimes we still go out and collect them but not like we did before. Our country has been changed by cattle and weeds like buffel grass, so we can’t find all the old foods like we once did. I’ll keep telling the kampurara story in my work though, that keeps the stories, songs and dances about these important foods alive and strong. I was born in Mimili in 1951. I was still a little baby when I moved to Kenmore with my father and mother. My father worked for whitefellas digging wells and anything else. I stayed in Kenmore until I was a man. Then I moved to Ernabella for marriage. I have been a priest for over twenty years. I spent a long time travelling around, everywhere, Western Australia, Northern Territory, working for the church. Talking and singing, Inma. I still know traditional Tjukurpa. These are good stories for Anangu. They show you how to look after people. In my work I tell different stories, some Christian, some Tjukurpa but they are all good stories for showing us the right way to live. Some of my work is the Maku Maku story, which is from a Tjukurpa near Mimili. Long time ago people came here. When the maku was finished people singing the maku to make them come back. Singing and scattering leaves to make the maku come out of the ground. Other works are about Moses and Abraham and others are stories passed down to me through my father. One is about the nest of honey ants called nyinantu and another about a seed called Kaltu Kaltu, which was also my father’s name. My name is Lynette Lewis. I am a mother and artist from Ernabella. I started working in the art centre two years ago, in 2015 when my youngest daughter started school. My mother started working in the art centre when she finished school at 16, more than 40 years ago! She started with weaving and travelled to Sturt Art Centre in 1971 and later learnt batik. Now she paints alongside my sister, Langaliki. My two eldest daughters, Jayanna and Amelia are twins.They have just finished school and joined us here working at the art centre. My father is the punu (wood craftsman) boss from Ernabella. He is a tjilpi (old man) but he still teaches the young fellas how to make spears. The designs and Tjukurpa I mark in clay are about around the beautiful country I see around me, the flowers, the grasses and all the plants we know and sometimes collect to use as medicines. I also tell my father’s tjala (honey ant) story. It is about a place called Makiri near Fregon. When I was a child the whole family would travel there to dig for honey ants. I guess my work is like my days at the art centre, always with family at the heart of it. We all work here together, three generations. Maybe in 40 years’ time my daughters will be senior artists (like their grandmother is now) and their grandchildren will join them to start learning too. I only started working in the art centre in 2007. When I was a younger woman I had lots of children, five girls and one boy! Now I work in the art centre everyday creating paintings and ceramics. My works are about tjulpu tjuta (birds). People call me Tjulpu Thompson! Like I did with my children I now raise chicks every day on canvas and in clay in my work! I paint my grandfather’s country near Kanpi in the Western APY Lands. It is the kalaya (emu) that formed that country. He travelled from Kanpi to Watarru. Sometimes in my work I use something special, a slip that we collect from the sides of the road after it rains. We call it Pukatjanya manta (Pukatja’s earth) but other potters call it terra sigillata. My daughters and my granddaughters and other young women go out and scoop up this dried up earth. They bring it back to the art centre and mix it with water and scoop out the water from the top until they get a smooth slip that we can paint on our pots. It is the colour of our country. The colour of our land formed by the tjulpu tjuta (birds) and other animals from the Tjukurpa. I was born in Papunya in the Northern Territory. My mother is a Pintupi/Luritja woman from Kintore and my father a Pitjantjatjara man from Pukatja. My mother’s mother was Makinti Napanangka, an important Papunya Tula painter. My father’s parents raised me at Katji Katji homeland near Ernabella. My uncle was the late Punch Kawaki Thompson (one of the leaders of the APY land rights movement) and my aunt is the Ernabella artist Carlene Thompson. My grandfather taught me about country, to look and to see the world around me, full of tjukurpa and kuka (animals). It is through him that I was given the eyes for country and also important tjukurpa. I have marked these stories in clay since 2011 but they have been stories I have held them for much longer. I first started working at Ernabella Arts in 2011. Before that I worked at the Ernabella Aged Care for nine years. The other staff there knew that I loved to draw and paint and so sometimes they would bring me materials, watercolors and things like that. Then in 2011 the first Watiku (men’s) workshop was held at the art centre. Senior artist Pepai Jangala Carroll knowing that I liked to draw suggested I join in on the workshop. After a bit more encouraging from Pepai I joined the other men learning about working in clay. I loved it from the beginning, as I realised that I could transfer my drawings and stories of country on to ceramic forms. My name is Thomas Tjilya but these days most people call me Ilytjari. I am an artworker and artist at Ernabella Arts. I have worked at the art centre since 2015. I started at the art centre as an artworker, helping out by stretching canvas for the painters. Then they had a wati (men’s) ceramics workshop at the art centre and Pepai Jangala Carroll and Derek Jungarrayi Thompson and others asked me to join in. Working in clay is a new thing for me but art centre’s aren’t. Years ago I was the first Chairman of Tjurma Arts which was the very first art centre in Amata. I was born in Amata; my mother and my uncle were very important artists and elders from Amata. When I moved to Ernabella I started work in Land Management as a Ranger. My wife and I worked together as Rangers protecting waru (rock wallabies). But now once again I have returned to art centres. I enjoy working alongside the other men. I do things a bit differently from the other artists though, I scratch into the clay before I paint down the underglaze to create an inlay. Everyone can try their own way here and that’s what I really enjoy. As a proud Erubian my tribal clan is Peiudu, one of four tribes on Erub. My family has always encouraged my art practice giving me confidence and motivation to keep developing my ideas and techniques. The inspiration for my artwork is from my heritage, livelihood and the environment, in which I live and the cultural traditions that have been passed on through generations and taught to me through story telling and song and dance. Dance is a way that Torres Strait people interpret history and legends, to share the meaning and significance to others. We continually rework and adapt songs and actions with body ornamentation, elaborate costumes and dance apparatus to create a rhythmic living message. As a way of generating a message I reinterpret stories in my designs and incise them onto the surface of objects. This brings the objects to life for me. My artistic journey began on Erub in 2003 when I had the opportunity to work with the ‘Green Turtle Dreaming’ project as the art department teacher aide at the primary school. My love of ceramics stems from this time, working with the children making life sized figurative works relating to our cultural stories and legends. I went on to be a founding member of Erub Arts. As the boys in my family had other interests, my father taught me so many things as a young girl. I used to go out diving and fishing with him. He’d tell me stories of his young days diving for pearls in what is known as the Darnley Deeps. I love all that lives in and under the water, the waves the grace and beauty of this environment inspires me. When I am in the water swimming and diving I feel complete. My work expresses my relationship with the sea as I explore the links between people’s surroundings, objects and our culture. Theresa Beeron is a Jirrbal and Girramay Traditional Owner of the North Murray Area. She is a holder of traditional knowledge and currently lives at Murray Upper, north-west of Cardwell. Theresa was taught to weave the traditional baskets of the Jirrbal and Girramay people by her mother when she was young. She specialises in finely crafted mindi baskets made with special rainforest and river grasses. Theresa also creates the other traditional basket styles such as burrajingal and jawun from lawyer cane. As Theresa’s mother did, Theresa continues to pass on her weaving skills to the younger generations. Theresa is also a painter and potter and her work reflects her Aboriginal heritage, traditional stories and the environment in which she lives. Her artwork is held in a number of institutions including Artbank Sydney, and the Queensland Art Gallery and many private collections. She is regularly called on to run workshops and provide cultural advice. I am a weaver of traditional baskets and am now doing painting and pottery. I have been coming to Girringun every week for a long time now to do workshops. We meet other people here too, like the people who have been coming from Ingham. We enjoy doing pottery together. Now we are making shields and bagu out of clay. The bagu is the thing we used to make fire with. The bagu, the shields and other things that were painted also told stories of the person who painted them. The timber we have always used for them is now hard to get. I think it is important to share our culture with everyone so they can learn about the rainforest people. .Nephi Denham is a Girramay Traditional Owner of the North MurrayArea. He is a speaker of language and currently lives in Tully. Nephi has been working with Girringun for several years now and has a wonderful grasp of form and line. He loves to work with his hands and has nurtured his creative talents over time moving between painting, printmaking, ceramics and sculpture. He was an assisting artist on the Chainsaw Gunduy Sculpture in 2014 and has a focussed interest in sculptural formats. Nephi’s work reflects his Aboriginal heritage, traditional stories and the environment in which he lives. Nephi’s work is included in a number of major collections including the Gallery of Modern Art, Qld Art Gallery, University of Queensland Art Museum, the Charles Darwin University ACIKE Collection and others. Doing art is a part of who I am. It has allowed me to learn and to gain knowledge and cultural understanding. Younger people often ask me about what I do and I pass on my knowledge when I can. It makes me feel good to see my work when it is finished. A Girramay man of the Murray Upper area north of Cardwell, Philip creates work that reflects his cultural ties to country. A language speaker and knowledge holder Philip wants to work with other Traditional Owners to share what he knows. He is a creator of traditional tools and has an extensive knowledge of the environment and its resources. Philip was taught by his parents Andy and Daisy Denham, highly respected Elders of the area. Philip is a relatively new artist with the Girringun Aboriginal Art Centre but his creativity and interest in working with new materials is showing astounding results. He is keen to learn and is always ready to lend a hand. It is really quite good for me to work with clay. I enjoy working with my hands. I think I must be a big kid. It’s like playing with plasticine. When I go fishing and diving in the river I’m always keeping my eye out for clay. When I go round about I’m looking for clay and string tree so that I know where to go next time I need some. I use them to make the old tools, the bagu and boomerangs. 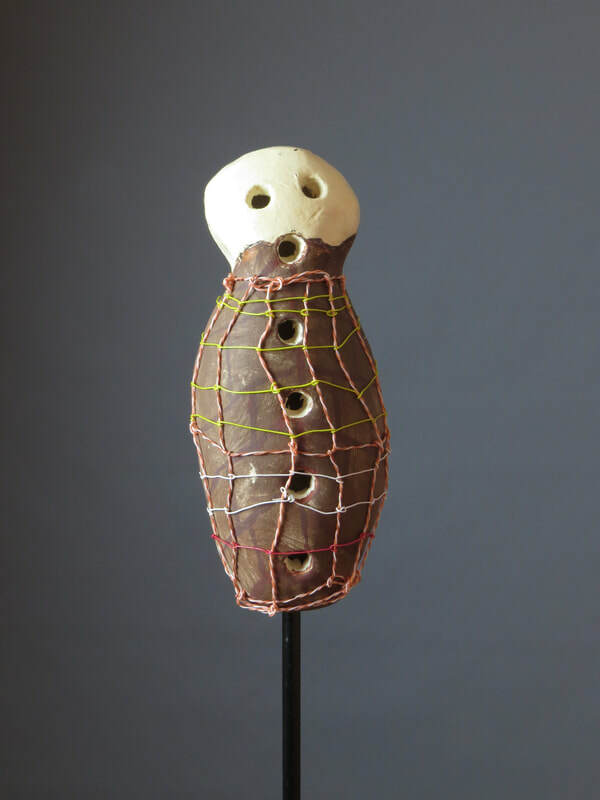 I look for different coloured clays to paint the timber and use the bark to make the string. If I know where to find it , It’s there when I need it. I really like to see the work of other people and seeing their work inspires me to do more of my own. Abe Muriata is a Girramay man of the Cardwell Range area. A self-taught weaver of the lawyer cane jawun, Abe explores different techniques to create finely crafted bi-cornual baskets unique to the rainforest people. Abe taught himself the weaving technique from watching his grandmother make them when he was a child and by studying old examples in museums and galleries. He is inspired by the precision of craftsmanship of jawun created by his ancestors. Abe also creates different manifestations of jawun by using other materials like ceramics and recycled and non-traditional materials. Abe also creates traditional rainforest shields and boomerangs made in the traditional manner and painted with traditional ochres and designs. These shields were used for sorting out disputes and for ceremonial purposes. My work is grounded in my culture which comes from the rainforest area of Far North Queensland. I take pride in creating finely crafted woven lawyer cane baskets, known as jawun. These traditional bicornual baskets are the most perfect thing for me. When I am weaving the form I am always working to maintain perfection. It is the weaving technique which allows me to achieve perfection. The work is very fine and I am stubbornly dedicated, making an icon that you don’t see any more. The ceramic works I create maintain the jawun form but uses a different medium, clay. 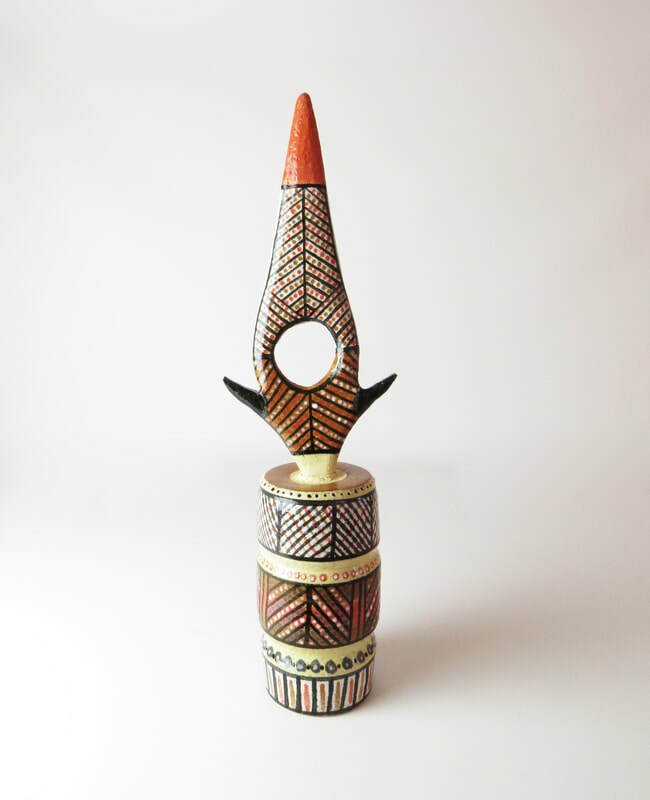 The material provides a strong link between the ceramic forms and the traditional jawun because ceremonial jawun were often decorated with coloured ochres, as were other traditional objects such as shields and boomerangs. The perfection will always remain in my jawun as long as there are traditional materials available. The contemporary items point to an alternative should the traditional cease to exist. There is a twofold and very real meaning here. If we don’t have access to traditional materials or if traditional knowledge and practice ever ceases a contemporary form of what is traditional will only be suited for the visual effect. Should we not be making or using the jawun any more we would only be admiring its contemporary counterpart. Emily Murray identifies herself as a Girramay and Jirrbal Traditional Owner of the Davidson Creek area. Emily lives at Murray Upper, north-west of Cardwell. Emily has a very strong connection to place and heritage and draws from traditional stories, calendar events in the lives of plants and animals, and the places where she lives and camps for her inspiration. Emily is not afraid of a challenge and works across a number of mediums including weaving, painting and ceramics. Her work is represented in a number of private and institutional collections in Australia including the Queensland Art Gallery. As a weaver of traditional mindi baskets, Emily has been a tutor and demonstrator of weaving practises at schools and art centres across Far North Queensland. I enjoy making pots and doing ceramics more than I like painting because I am making things from the start. I like playing with mud. I am satisfied that I have made something good if who ever looks at my work and they like it. Sally Murray is a Girramay/Jirrbal woman of the Davidson Creek area. She lives at the Jumbun Community at Murray Upper. She is a skilled weaver of the traditional Gundala basket, a coil basket made with a split lawyer cane and the traditional small grass mindi basket. Sally is also a well respected painter, potter and printmaker. She draws on her feeling for the landscape to visually express the environment and stories of her cultural heritage. Sally passes on her traditional knowledge to the children and other members of the community through weaving workshops and field trips. Her work is included in a number of major institutional collections including Queensland Art Gallery and University of Queensland Art Museum. It is something I like to do. We like to get away from home to go to the art centre. To be with family and friends. We went out to get some clay off one of the farms last year. Some of the clay we collected was orange and it changed colour after it was fired and again after it was glazed. I was surprised at the difference between what it was like when it was in the paddock and after it came out of the kiln. Eileen Tep is a Jirrbal woman of the Davidson Road area. She lives at the Jumbun Community near Murray Falls, north-west of Cardwell. She is a skilled weaver of Mindi, Gundula and Jawun bicornual baskets. Eileen learnt her weaving skills from her mother. When creating baskets, Eileen collects lawyer cane from the rainforest in the local area, removes the spiky outer ‘skin’ of the cane and prepares the cane from splitting by passing it through the fire. The cane is then finely split and woven into the Mindi, Gundula and Jawun bicornual shape. I make traditional tools and make bagu and pots with clay. I learnt a lot from my mother and I like to make things with my hands. I’ve had to learn how to work with clay since being at Girringun. It was a new experience for me. I do painting and pottery and find that what I paint on canvas and on clay influences each other. I prefer to work with clay as it is closer to making traditional tools. I like to keep up what my parents taught me. My name is Hayley Coulthard, I am Panangka. I was born in Hermannsburg. Before, when I had no work, I used to come to the pottery and see my mother Anita and all the other ladies working. One day, my mother asked me, "Come and work with me and all the ladies." So, I started with clay. My first painting was on a little pot with my mother’s country, Palm Valley. For my second work with clay, I made one a little bigger with Mt Sonder, trees, sandhill, mountain, sky, flowers and bush tucker. On both the lid and pot I made irrkarlaantja (hawk). My mother, sons, sisters, the whole family, go out for picnics on the weekend. I walk around to see the bush, the flowers and different kinds of birds. When I walk around and down the river I am thinking when I go back to the pottery I will paint that story, that country on my pot. I am happy working here because my mother, my cousin, my sister are all working here. Now my son is working here too. I like working at the pottery every day, I will be working here forever. My name is Judith Inkamala Pungkarta. I was born in Hermannsburg and I am the Chairperson of Hermannsburg Potters. I remember people painting watercolours on paper. I was a little girl. After school we would go around, visiting the artists. There were a lot of people painting then. I was friends with Gilian Namatjira, Albert’s granddaughter. We went to school together. I know, I saw, I was born here, I grew up here, I remember Namatjira, that’s why I paint on my pots. Naomi Sharp, she taught the ladies about ceramics in the bush. She taught in this little building here in Hermannsburg. I remember I was sitting down. I tried. Then the next morning, I tried again. I kept trying. I felt, I’ve got to come back to make pots. I make pots with my hands using coils. I build up my pot like this. Sometimes big ones, medium size and small size. I like it, working with clay, it feels nice. When we are making pots and paint we are feeling really strong. We need to teach the young ones to keep going with the clay. It’s good, makes me happy, we feel happy to keep going with clay. I tell different stories on my pot: landscapes, people swimming, fishing, make birds. When I go bush, I think ‘that’s nice,’ and when I come back to pottery, I start painting. Sometimes we go to Alice Springs, on the way you can see a lot of hills, mountains… It’s nice. So I make mountains. Rona was 20 years old in 1990 when she first came to the pottery studio. Born with a severe hearing impairment Rona developed strong skills in painting, drawing and non-verbal communication. She first came around to see the ladies in the pottery. They were making pots and she thought, ‘it’s good fun here!’, learning from the ladies. All the ladies taught her how to make pots. She was really happy and thought she might come to pottery everyday. The first day she was making small pots. The next day, medium size and now she can make big pots! She comes every morning and is thinking its great to work with clay. It’s soft and relaxing. She was really happy to be in the pottery studio with everyone and talking to everyone. The pottery studio is a strong community! Rona paints her pots thinking about this community, Hermannsburg. She paints horses, cows, bullocks, cats, dogs, pigs, perenti, birds, cowboys and cowgirls. Thinking and mixing all the colours to make animals and other things from here. She signed "I’m happy when I’m working in pottery. " We always making! We make birds, anything! Goannas, kangaroos, mountains. Mountains a good one! We can make women, children, football, some swimming in the water, children. We put them on there so that everyone can see them, see that there are some people here, making. My husband Pastor Nahasson Ungwanaka was making long time with bush clay. In Hermannsburg he started making clay, everyday working with clay. Naomi Sharp was here in this shop. All the women came here to work. They wanted to learn. Many years ago, I was thinking because my husband gone now, I should go to pottery now, start work. This place in here. All these animals, we can make anything with them colours, hunting with a spear, woman digging some honey ants. Anything! Koala, goanna, good food. We can make the drawings in the clay. Marra! (Good!) We can make clay for fun! It feels good, we like to make clay in here. Marra! Hard work feels good! We want to work here. Everybody’s making and we know how to make things from clay with our hands. Every day, we are working together, making clay. We use ideas, think up something different. Then, with our hands… our memories, we can make them on the pots. My heart feels good. I like working this way, with the clay. I have been working in the pottery for a long time, when all the ladies were here. Since then, many old ladies have passed away. I am still here, working. I was taught to make pottery here in Hermannsburg. I like to make pottery. It’s good! Otherwise I would be sitting in the house doing nothing. I like working with clay, working with my ideas. I paint a story, of animals, mountains, country. For a long time my ideas came from thinking about my Mother and Father, my childhood and my father’s outstation ‘Lila’. My father was Pastor Peter Bulla, a Christian father. A long time ago, I worked at the pottery with my sister Esther. We were really happy working together. Still, I am here working with the ladies everyday. Clay feels good and when I’ve made my pot I can paint it with my ideas. I started working with the Tiwi Design Potters in 1979. I trained in ceramics at Bathurst Island by the pottery founders Eddie Puruntatameri and John Bosco Tipiloura and studied at Nepean Technical School in New South Wales and Darwin Institute of Technology. I was taught to carve (tutini) by my Grandfather Gabriel Tungatalum. I can also doprintmaking, ironwood carving and painting. I am concentrating on painted earthenware, sometimes depicting groups of Tiwi and occasional religious imagery. I also worked with Luna Ryan and made cast glass in 2007 with a national touring exhibition titled Mamana Mamanta, Gradual Friendship. At school I painted this Island, pencil and I came second – I got a lolly. It really put me in the art. Actually my grandparents were artists too. My grandmother Agnes did bark painting, on tunga, and I did carving with my grandfather Gabriel Tungatalum. Bede is my uncle – my mother Edwina is his sister. My grandfather taught me with an axe, about the shape, to make it clean and easy to paint on. I was a good painter when I was a little boy. Everyone would see that small pole, we all have different shapes and people could see the pole design and say, ‘This belongs to Gabriel’. It’s like teaching – the design has meaning, like body painting when someone dies. My designs are father’s land – red, white, black, yellow. Red represents the sun and because the yellow turns red after burning it is a bit the same. Mt totem is sun and dance is dingo.